More than 5,000 star-formation "bubbles" have been identified in the disc of our Milky Way by citizen scientists working through Spitzer Space Telescope data to help decipher the secrets of stellar birth. Young, hot stars blow bubbles out into the surrounding gas and dust, providing a signpost to new sites of star formation. Over 35,000 citizen scientists contributed to the first Milky Way Project data release which identified some 5,000 bubbles, ten times as many as previous surveys had found. The project, run by the Zooniverse and the Adler Panetarium in Chicago, is based on data from NASA's Spitzer Space Telescope and requires at least five users to flag a bubble before it is entered into the catalogue. The project identified bubbles of all shapes and sizes, reflecting differences in distance from Earth and local gas cloud variations. 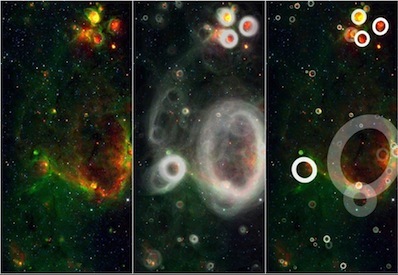 Citizen scientists are presented with a small section of Spitzer's huge infrared Milky Way image (left) to scan for cosmic bubbles, drawing a circle around each one. All user data is then overlaid (middle). At least five volunteers must flag a candidate bubble before it is included in the final catalogue (right) where the faintest bubbles indicate a 'hit-rate' of 10 percent and solid white 50 percent or better. Image: NASA/JPL-Caltech/Oxford University. Other unusual objects have also been flagged up in the search, including green "knots" and fuzzy red objects, which would have likely otherwise been missed by automated searches.